The kit that your team wears speaks a thousand words about you as a group. It determines the perception your fellow opponents have of you and even the way you see yourselves. With so much riding on it, it’s no wonder that it’s such a difficult task to pick one, especially when you’re trying to do it within a tight budget. The great thing about 5-a-side (and 6 or 7-a-side for that matter) is that there are so many options when it comes to what you can wear. To help you navigate through this minefield, the following guide has been put together to steer you away from disaster and help you pick your perfect kit, whatever your budget. By the time we’re finished you’re going to see how getting a decent kit will improve your 5-a-side experience, and that you can do it for the cost of less than a couple of weeks’ match fees! Before we look at the options below, it’s first worth considering a few important questions. What sort of team are you – why are you playing the game? For some, it’s primarily the good times and comedy capers, with the results mattering less. For other teams, it’s going to be about looking professional and annihilating every team in your path. How much use are you expecting to get from the kit? Is your foray into 5-a-side going to be a lasting relationship, or are we looking more at a one-night-stand situation here. What’s your budget? 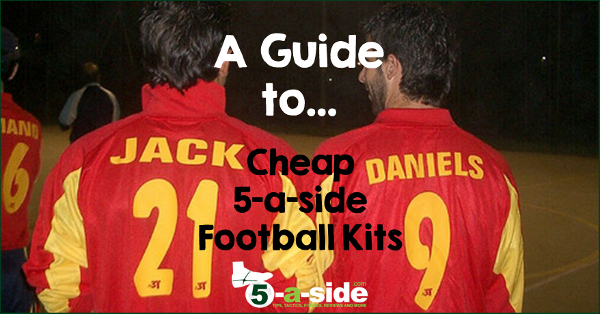 Teams are always looking for cheap 5-a-side kit, but just how much are you prepared to spend? How many kits do you need to buy and what sizes do you need? You can save yourself a lot of time and disappointment by ruling out kit that doesn’t have the availability you need. My first 5-a-side kit, back in the 1990s, was a polyester number which looked pretty dreadful. Worse still, its cheap construction resulted in it collecting dangerous levels of static electricity that built up every time I put it on or took it off. I am also pretty sure that it was highly flammable, which added an element of danger as I used to often wonder whether the friction of falling over on the Astroturf would somehow cause my shirt to go up in flames. Despite all its flaws, I loved putting it on week-after-week, and the memories made wearing that shirt were ones I’ll treasure forever. The good news for us all is that the major sportswear manufacturers have come a long way with their recreational kits in recent years. Unlike the replica kit they’re making for professional clubs, which seems to be getting more expensive and worse-looking, the range of kit they’re selling for amateurs is becoming cheaper and more tasteful (as well as no longer being polyester fire-hazards). What it says about you: you’re organised enough to buy a serious-looking kit so you should be taken seriously on the pitch too. 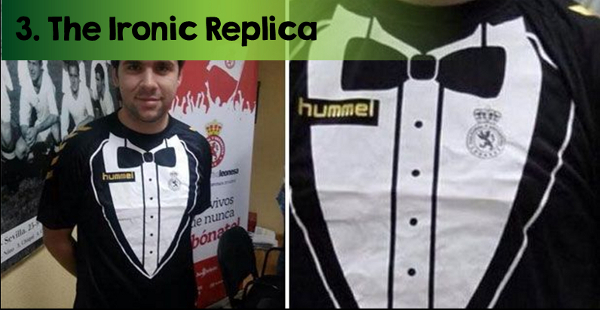 You’re not messing about with the shirt, and you’re probably not messing about on the pitch either. Check out: In the UK, we like these sites for a good combination of availability and price: discountfootballkits.com and www.directsoccer.co.uk – you can get all of the ones pictured above for under about £15 per shirt. 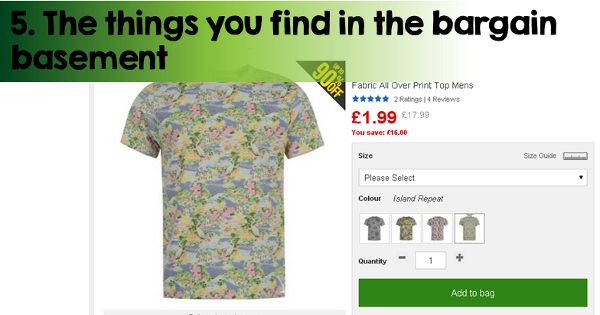 Thanks to the wonders of the world-wide-web and digital printing, it’s extremely easy these days to order a set of printed t-shirts at a very reasonable price. You simply pick a colour of shirt and then spend your time whittling down all sorts of hilarious inside-joke names to print on the back of them. Everyone should revel in pulling on their personalised shirt, laughing at each other’s names and all this for not much cost. The downside is that normal t-shirts aren’t really made for long-term sports wear and the hilarious names on the back, as well as the t-shirts themselves, may wear thin after several months. Still, it could be a good option for a one-off tournament. What it says about you: there is a high risk of looking like you’re all on a stag-do, especially the more you push the boundaries of decency with the names you get printed. Although printing your mate’s name on the back of his shirt as ‘the donkey’ is probably really witty and full of double entendre as far as you’re concerned, this inside joke is fairly meaningless to everyone else. Expect to be looked on as a potentially raucous bunch experiencing a one-off foray into 5-a-side. 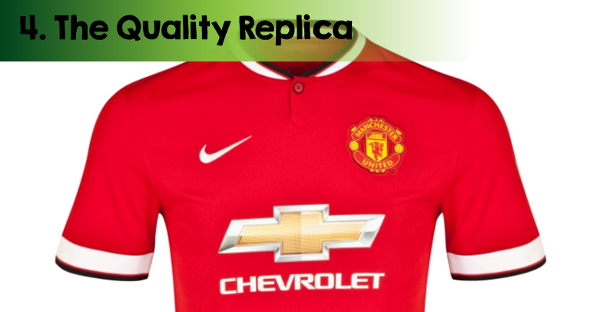 The truth is, not all replica football kits sell out. In many cases, sales of shirts are a lot lower than expected because either the shirt is crap, or the team is crap – or some tragic mix of both. That’s where your opportunity arises to get a shirt at a knock-down price and give it the love that nobody else was prepared to. I’ve seen this done brilliantly a few times. Back when I was at school playing in an evening 5-a-side league, a team all turned up in a garish golden-coloured Wolverhampton Wanderers replica kit. When I asked if there was some significance behind the Wolves kit, they told me that there was none whatsoever, it was simply the cheapest football shirt they could lay their hands on. Actually, it turned out to be a masterstroke. Not only was it a comically atrocious kit (which clearly they bought on the cheap because even Wolves fans didn’t want to buy it) they were able to develop an identity around it, weaving the word ‘Wanderers’ into their team name. They weren’t a bad team, either. What it says about you: Initially likely to cause some confusion as to why you are all playing in an obscure team football kit, but eventually likely to be fairly endearing to your fellow competitors. You’re organised enough to have sorted out a kit, but you haven’t taken the task too seriously. If you can complement your choice of kit with a mildly amusing twist on that team name (how about ‘Dances with Wolves’ / ‘Woefulhampton Wanderers’ – see our guide to team names for ideas) then you are almost certainly on to a winner. The worse the kit, and especially the worse the team it represents, the more likely everyone is to give you nods of silent appreciation. Check out: This will require a bit of shopping around – make sure you’re doing a search by selecting ‘Price – Low to High’. 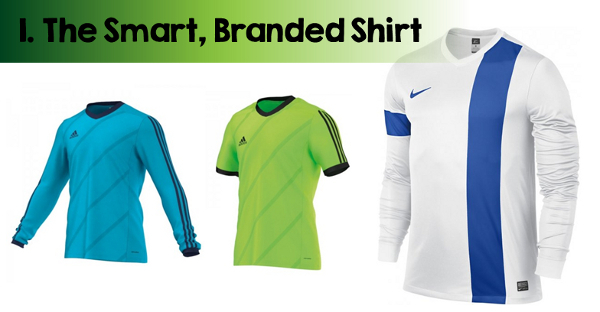 Have a look at the ‘specials’ in UK Soccer Shop who have a massive range of kit. Less choice but cheap is MandM Direct. Also take a look at Sports Direct and Lovell Soccer. This one only makes sense if you’re all supporters of the same football team. Let’s say that you’re all Manchester United fans then you might all want to buy the latest club kit. At around £40-60 that wouldn’t be cheap at all. So the thinking goes, why spend another £10-20 on your 5-a-side kit when you could save the money and put it towards a kit you’ll wear for more than just 5-a-side? What it says about you: remember that football is a very tribal sport and whilst you might think that lining up wearing Manchester United kit makes you a good supporter, it’s likely to be like an invitation for a Liverpool or Manchester City supporter to take an instant dislike to you. Especially if there is the merest hint that you’re taking yourselves too seriously, living out some sort of dream of actually playing for the club. If you go down this route, you might want to have a comical twist on the team-name to show that your intent is harmless (“Man-chest-hair United” or something similar? Again, see our list of team names for ideas). 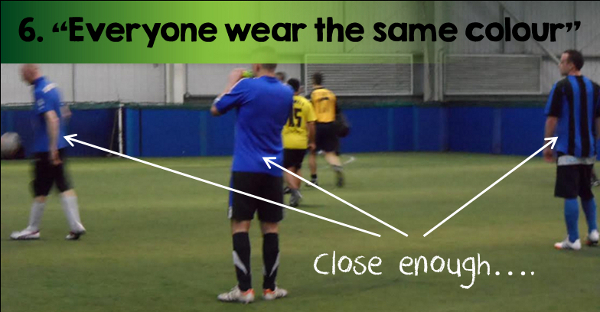 Whatever you do, make sure you don’t buy matching shorts and socks as well, or this will result in instant ridicule. If your budget is very tight and you need some really cheap football kit, it’s time to hit the almighty bargain basements of the internet in pursuit of all the garments that nobody else wants to buy. Don’t worry, this can be a lot of fun – maybe the most fun of all. Your choices might include the ironically bad replica kit (see above), but as beggars can’t be choosers it’s also worth widening your net to all types of sportswear tops. I’m confident that you can get sorted out for less than £5 –that’s less than one week’s match fees for some people! The only issue is that, as these items are usually ‘end of the line’, there may be limited availability. What it says about you: committed enough to the cause to have bothered coordinating your kits, but relaxed enough that you didn’t want to significantly cut into your beer-money fund in sorting it out. If you’re good fun on the pitch then your dreadful bargain-basement kit will probably afford you semi-cult status. Check out: Make sure you’re always searching with ‘Price – Low to High’. Our favorites are Sports Direct – click here for their Men’s T-Shirts, and here for their Football Kits & Replicas, as well as the T-Shirts at MandM direct (where you can also quickly see size availability too) and Amazon which has a very large selection of all sorts of T-shirts. Showing a distinct lack of imagination, you can all quite simply agree to wear the same colour. Whilst this is definitely the easiest and cheapest approach, you’re missing a great opportunity to have a laugh choosing something. In the long-term, if you’ll be playing regularly as a team, it’s well worth getting a kit sorted out. What it says about you: you might be a team, but you’re not enough of one to have bothered investing a small amount of your cash in getting a kit. Suspicions will therefore be raised that either a) you don’t know each other that well, or b) you’re not really that bothered about this whole 5-a-side thing anyway. Maybe that’s the look you’re going for, who knows. Check out: your own wardrobe. If the decision is ‘wear something red’ then you’ve probably got that already. If you don’t and you’re on a very tight budget, then go to Primark. 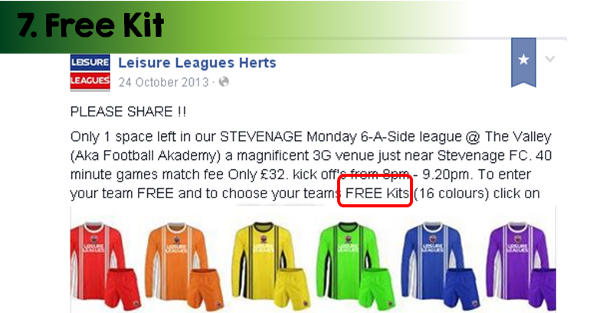 A few competitions, such as some Leisure League franchises here in the UK are known to offer free kit as enticements to new teams (that’s where the screen print used in the above picture is from). It’s hard to knock something that’s free, and taking a kit is probably a good idea if you don’t already have one. However, there are a couple of minor down-sides. You will find that their kit is almost certainly likely to carry the organiser’s branding so you’re going to be a walking advertisement, and if your team is going to be playing in multiple competitions then you might not feel like taking this kit elsewhere with you. The kit only comes in 8-12 colours and usually only a couple of designs, so choice is limited (especially if other teams have already chosen the colours you want). What this says about you: not a lot really. You were offered a free kit; you took it. Only where you start wearing that kit proudly in other leagues and tournaments does this start to seem a bit strange. Check out: Your local league provider, particularly Leisure Leagues. If you’re interested in kit, make sure you ask if they’re offering any freebies before signing up. You might not actually need a kit. To state the very obvious, if your 5-a-side games consist of 10 people forming 2 teams and playing against each other, bibs are what you should be looking at instead. Names and numbers – most teams don’t seem to get names and numbers, probably because of the extra expense it adds. However, if you’ve got the budget, it can be a nice touch and add a dash of professionalism to your look. However, beware the perils of looking like you’re on a stag do if you’re going for jokey names. Spares –if your recreational team is similar to every single one I’ve ever played in then you’ll be hunting around for extra players as cover from time to time. Whilst you can ask that player to bring a coloured shirt that is similar to yours, you might want to have a spare shirt or two ready for these occasions. For the sake of everybody putting in just a little extra cash, it could be worth it. Full kit –generally most teams just go for the shirt and then everybody garnishes their outfit with their own shorts and socks combinations (sweatbands entirely optional). Largely, this is due to people wanting to avoid the extra expense but, for some, going all full-kit is a step too far anyway. See what sort of deal you can get in shorts and socks, but really most of your focus should be on the shirt. What type of kit does your team wear, and why? Have you ever made a bad mistake with your kit? Have we left something out of our guide? Can you suggest another idea?